Doha Bank hosted an event on 4th August 2017 at Shangri- La Hotel, Sydney on the topic “Qatar – A sustainable performer“. The event was well attended by leading Corporates and Bankers in Australia who were keen to hear more about Qatar and to explore further business opportunities with Doha Bank. 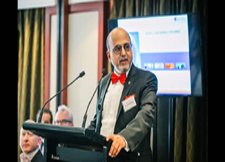 Following the keynote address by Dr. R. Seetharaman, there was a Q&A session, which the audience was very active in, stimulating further conversations and opportunities between Australia and Qatar. Mr. Frank Hamer, Head of International Banking, Doha Bank gave the Vote of thanks which concluded the event.